On arrival at Kochi airport, meet our representative than drive to Thattekkad. a lowland forest with several types of eco-systems - riverine grasslands, evergreen, scrub, dry deciduous, lowland forest, enabling it to be one of the best birding destinations in India. This is also home to most of the endemics of the Western Ghats. One should sight the Whitebellied Treepie, Rufous Babbler, Crimsonbacked Sunbird, White Bellied Blue Flycatcher, Wayanad Laughing Thrush, Malabar Parakeet, Malabar Grey Hornbill besides owls like the Mottled Wood Owl, Oriental Bay Owl, Oriental scopes owl, Brown Fish Owl, Oriental Scopes Owl and Spotbellied Eagle Owl. Red Spurfowl, Grey Jungle Fowl, Indian Pitta, Black-throated Munia and the Grey headed fishing eagle. Overnight stay at the hotel. Morning after breakfast, drive to Periyar Tiger Reserve is one of the finest wildlife & birding destinations in South India, with over 320 bird species identified and a leading habitat for the Bengal Tiger, this sanctuary is an ideal wildlife & birding tour. Asiatic elephants, Gaur, sambar, tigers and sloth bear sightings are possible on safaris into the forest. This is also an ideal place to sight the Great Hornbill. Overnight stay at the hotel. Morning after breakfast go to Munnar via the Ghats to Khambam where we should sight the Large Grey Babbler, Common Babbler, Jungle Bush Quail and the Grey Fancolin. then proceed to Bodi Ghats en-route Munnar and stop over for sighting the rare Yellow Throated Bulbul, Indian Robin, Sirkeer Malkoha, Short Toed Snake Eagle, Bluefaced Malkoha and the Black eagle. We will reach Munnar by evening. The next day we will go birding in the sholas (high altitude montane forests) and grasslands for the Nilgiri Pipit, Painted Bush Quail, Nilgiri Wood Pigeon, Black and Orange Flycatcher, Nilgiri Flycatcher, Whitebellied Shortwing, Broadtailed Grassbird, Grasshopper Warbler. Overnight stay at the hotel. Morning after breakfast drive across the Tamil Nadu border to the Indira Gandhi national park - a place known for its great swathes of forests and wildlife - birds, butterflies, elephants, sloth bears, leopards, gaurs dholes, king cobra and the lion-tailed macaques in their natural habitat - all within an area known as Top Slip. We will also bird at the adjacent Parambikulam Reserve as well drive on a wildlife safari through the forest trails. Overnight stay at the hotel. Morning after breakfast drive to Ooty by afternoon, check in at the hotel, 03kms. from town on the Avalanche road will be our main destination, where the endemic Nilgiri Laughing Thrush, White-bellied Shortwing, and Black-and-rufous, Rusty-tailed and Nilgiri Flycatchers all occur. Overnight stay at the Hotel. Morning after breakfast, half day birding at Ooty looking for the Nilgiri Laughing Thrush, then drive through the Sirgur Ghats to Masinagudi. Mudumalai at the foot of the of the Nilgiris hills, is one the many reserves located within the forest belt between the Western Ghats and the Nilgiri Mountains. The terrain being varied with hills, valleys, ravines, watercourses and swamps, moist deciduous forests, dry deciduous forests and scrub forests is ideal birding country. Should see Jerdon's Bushlark, Sirkeer Malkoha, Indian Blue Robin, Chestnut-bellied Nuthatch, White-bellied Minivet, Yellow-billed Babbler, White-bellied Woodpecker, Large Cuckooshrike, Banded-bay Cuckoo, Thick-billed Warbler and Painted Bush Quail. Overnight stay at the hotel. Morning after breakfast drive towards Mysore, visit the famous heronry on an islands on the Cauvery River at the Ranganthittu Wildlife sanctuary. Rowing boat cruise enables view of Eurasian spoonbill, Black-crowned night heron, three species of Cormorant, River Tern and Thick Knee, and many others. Marsh crocodiles will also be seen. Also visit the remote village Kokre Bellur for the Nesting Painted Storks and Spot-billed Pelicans followed by birding at a nearby reservoir. Evening transfer to Kochi airport time to catch the flight for onward destination. Birding around Thattekkad, Urulanthanni and Edamalayar Dam, we can see Whitebellied Treepie, Rufous Babbler, Crimsonbacked Sunbird, Oriantal Owl. Birding by Boat Cruise, we can see The Nilgiri Wood Pigeons, Black-winged Kite, Blue-winged Parakeets, Great Indian Hornbill, White-bellied Tree Pies, Laughing Thrushes, Fly Catchers, Darters, Cormorants. Birding in Munnar, we can see Large Grey Babbler, Yellow Throated bulbul, Indian Robin, Sirkeer Malkoha, Short Tode Snake Eagle, black and Orange Flycatcher, Grasshopper Warbler. Birding in Indira Gandhi National Park, we can see King Cobra, Butterflies, Sloth Bears, Leopards, Gaurs Dholes. 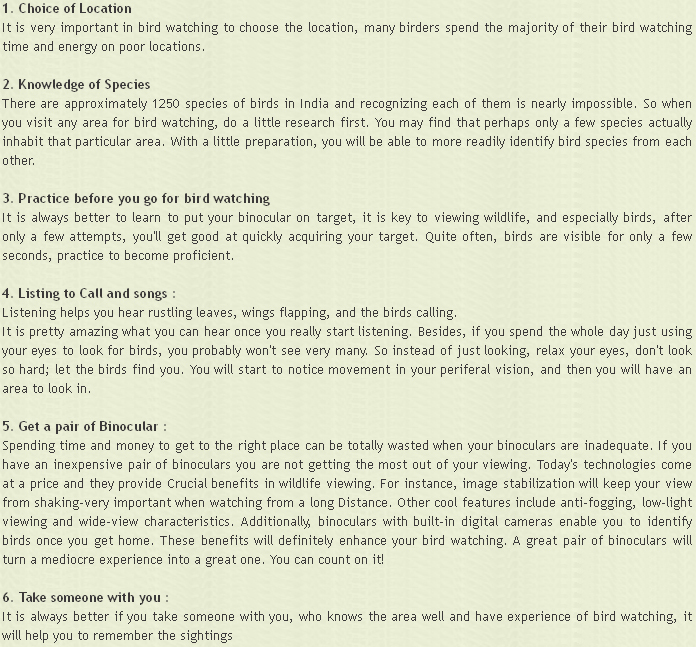 Ooty Birding in Ooty, Endamic Nilgiri Laughing, White Bellied Shortwing, Birding at Ooty. Birding at the Madumalai hills and valley, we can see Jordon’s Bushlark, Sirkeer Malkoha, White – Bellied Minivet, Large Cuckooshrike, Thick – billed Warbler.